Moth Migration Project is an ongoing project begun in 2017. The first exhibition premiered August 2017 and was a part of the larger “Cross Pollination”, the exhibit at 516Arts, Albuquerque, NM. 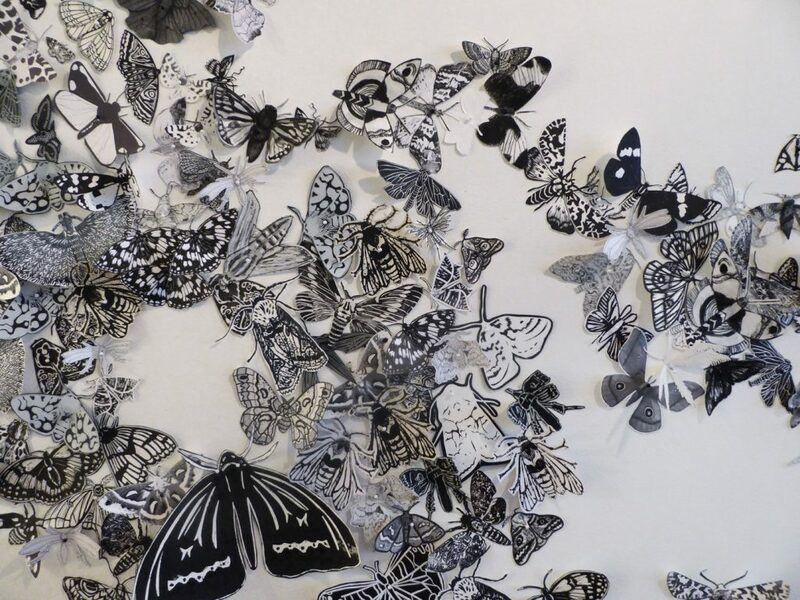 The Moth Migration Project founded by Hilary Lorenz is a crowd-sourced collection of hand printed, drawn and cut paper moths exhibited in multi-sensory installation. Choosing moths, a nocturnal pollinator, as the vehicle for cross-pollination and international exchange, and using social media I invite people to create paper moths native to their geographic location. The moths become a symbol of the global network with currently over 15,000 submissions from 26 countries. The MMP created a spirit more significant than any single community by fostering authentic connections and engaging public participation through a synergy of shared experience and embracing mutual respect for personal uniqueness and creativity. The Moth Migration Project spans all cultures, ages, countries. It is a tool for community building in both physical and digital worlds. Components of the MMP include free printmaking workshops for adults and children given by me, along with dozens of “moth ambassadors.” Moth ambassadors organize people to create moths specific to their region, then send the moths to join the carefully cataloged collection used for traveling exhibitions. I highly encourage educators to adopt the moth migration project to their classrooms as it is an excellent tool for STEAM learning as the inroads to both the sciences and art are tremendous. The spirit of belonging is elevated when each moth making participant receives their own postcard certification of recognition acknowledging their outstanding contribution. The MMP website lists all the artist’s name and highlights their location on a world map further fostering inclusion. A Facebook page, which you are welcome to join, connects artists who may live in isolated or remote areas. It also allows for the sharing of individual’s moth making process. The moths from community workshops are collected into small portfolios and duplicates can be sent out to friends and families in nursing homes and healthcare facilities to bolster their wellbeing. In the first six months, 53 organizations, 675 individuals from 24 countries created over 15,000 moths demonstrated the deep passion and desire to connect in straightforward yet powerful ways. The paper moths became the symbol of sharing and community which will continue to grow and develop with workshops and exhibitions. 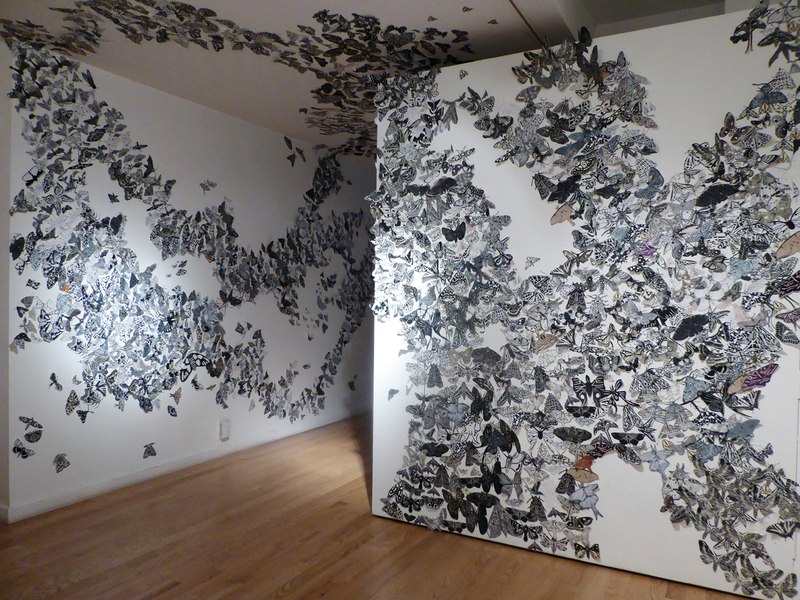 Adopting crowdsourcing as a form of artmaking dramatically changed my role and my practice. As an artist, I almost always work alone. Now, I feel like a conductor holding it together, encouraging each person to roll with their idea. I could not, nor do I want to control everything while building the Moth Migration Project. I let the project evolve, grow, and change. I have a vision, and I know that if I welcomed everyone in, it would be far more magnificent. 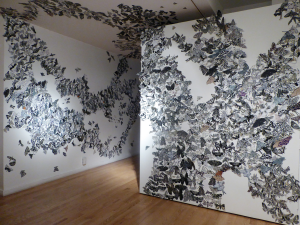 Would you like to join the Moth Migration Project and be included in exhibitions? You do not need to be an artist. Individuals and groups are encouraged to apply. Everyone from any part of the world is welcome. Please follow the details below. September 1, 2o18 – Sunbury Shores Arts and Nature Centre, St. Andrews by-the-Sea, New Brunswick, Canada, Seeks moth makers in New Brunswick and Nova Scotia, Canada, and Maine, USA especially encouraged to make regional moths. March 1, 2019, Bundaberg Regional Galleries, Bundaberg Australia, Calling all moth makers in Central Queensland, Australia, especially encouraged to make regional moths. Size: No larger than 6″ (15.25cm)and no smaller than 1″ (2.5cm). Paper weight can be variable, from about 30g/m to 270g/m. Species: Please consider researching and making your own regional moth. Please make at least 5 of the same moth for visual grouping, you may make as many moths as you like. Please print name, city or town, state or province, country on the back of each moth. Documentation: All artists locations will be documented at MothMigrationProject.Net. A text sheet and diagram with all participants will accompany the installation. Important: Moth shape must be cut out of paper. Please do not send moth with any background image or paper. Just the outside contour as seen in the top image. Fine Print: Due to the volume of expected contributors I am unable to return the moths. The exhibition will be well documented and all photos will be available from my website. Your contribution will also be noted on my website. There are no fees and no exchange of money involved.